Tiffany & Co was founded in New York in 1837 by Charles Lewis Tiffany, initially as stationery and fancy goods store on Broadway, styled Tiffany & Young 1837-1841, when it became Tiffany, Young & Ellis till 1853, when Charles Lewis Tiffany took complete control of the firm, and it was designated Tiffany & Co. From about 1848, Tiffany began to focus on silver and precious stones, controlling their own silver manufacturing shop from 1851. By 1877 they had acquired the Tiffany diamond, a large yellow stone from the Kimberley Mines in South Africa and in 1887, they acquired major pieces at the sale of the French Crown Jewels in Paris. They moved to Fifth Avenue in 1905 and to their present address, Fifth Avenue and 57th street, in 1940. TIFFANY: A late-19th century silver vase by Tiffany & Co, Edward Moore period, stamped TIFFANY & VO, STERLING SILVER, pattern number for 1875, pattern and order numbers 3567 – 6438 In the ‘Japanesque’ style, with applied fish swimming amongst water lilies above a frieze of stylised ripples and flowers, a fly landing on the shoulder, oblivious to the dangers below, height 19.5cm, weight 9.5oz. Tiffany & Co. Sterling Silver Vine Pattern Ice Cream Server Grapevine motif. Length 10 7/8 inches, approximately 4 ounces. EARLY TIFFANY & CO STERLING SILVER MUG. Circa 1865, bright cut engraved cartouche incised with name “Henry Baker Dickinson, 25th May 1868”; underside with Tiffany & Co., makers marks for Bogert, Newburg, NY; 7.3 ozt h. 4 w. 5 in. This silver vessel with copper inlay has a tapering quatrefoil cross section. An acute triangular spout interrupts the uppermost band, which is unadorned. The bottom has incised vertical ribs, intersected by a die-rolled band of stylized flowers. Alternating bands of silver with chased floral decorations and bands of copper inlaid with silver chevrons or circles terminate with a thin band of chased waves and stylized egg-and-dart molding just below the uppermost plain silver band. It has an applied foot and S-scroll hollow cast handle; the interior shows traces of gilding. 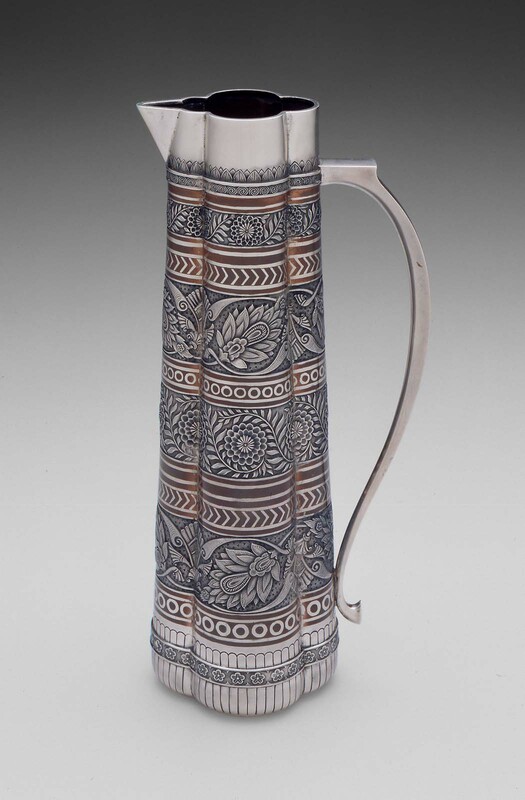 Acquired at the 1876 Centennial Exposition, this pitcher represents Tiffany’s new line of chromatically decorated silver utilizing mixed-metal techniques. It became the first piece of American silver to enter the Museum’s collection and distinguished the institution for its early interest in contemporary, as well as historic, art. Former Boston jeweler Gideon F. T. Reed, who was then a major shareholder in Tiffany & Co. and head of its Paris office, engaged Frank Hill Smith to select and acquire metalwork for the Museum from the Philadelphia fair. Despite an acknowledged conflict of interest, this pitcher became the first piece of Tiffany silver to enter a museum collection. Tiffany/Gorham? Aesthetic movement Sterling Silver mixed metal large bowl 18 oz. TIFFANY & CO Faneuil Sterling Silver Lunch Dessert Knife 7 1/2"
TIFFANY & CO. WAVE EDGE STERLING GRAVY LADLE W/ SHELL BOWL NO MONO 7 1/2"